SHOUP: Everybody likes free parking, including me, probably you. But just because the driver doesn’t pay for it doesn’t mean that the cost goes away. If you don’t pay for parking your car, somebody else has to pay for it. And that somebody is everybody. We pay for free parking in the prices of the goods we buy at places where the parking is free. And we pay for parking as residents when we get free parking with our housing. We pay for it as taxpayers. Increasingly, I think we’re paying for it in terms of the environmental harm that it causes. Shoup’s recommendations have inspired a series of reforms across the country, most notably an ongoing experiment in San Francisco called SFPark. The project essentially establishes a dynamic market for street parking by measuring average occupancy on each block and then setting prices according to demand. While the experiment is exciting for transportation scholars, it has attracted some criticism. Furthermore, one of Shoup’s former students has uncovered a snag that could undermine the project – or any attempt to manage parking more efficiently. Michael Manville, a city planning professor at Cornell, and co-author Jonathan Williams found that in Los Angeles, “at any given time almost 40 percent of vehicles parked at meters are both not paying and not breaking any laws” (paper here, and a Shoup op-ed here). How can that be? Very often, those cars display a handicapped placard that allows for free, unlimited parking. So you’ll hear about “placard abuse” and what’s being done to stop it. SHOUP: If it works, it will make San Francisco an even better place to live and do business and visit. It will just be yet another feather in the cap of San Francisco. And if it doesn’t work, they can blame it all on a professor from Los Angeles. 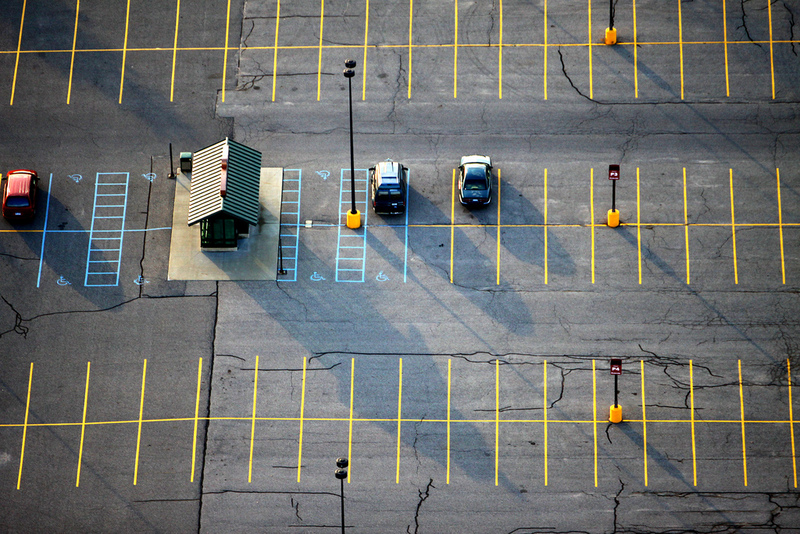 You’ll also hear from MIT professor Eran Ben-Joseph, whose book ReThinking a Lot: The Design and Culture of Parking offers solutions to improve the prototypical parking lot. He gives us a sense of how many surface parking spaces there are in the U.S. (close to 800 million) and points out that in some cities, parking lots cover a full third of the land area downtown. Here in Sheffield, UK we are a medium sized British city we have little parking supply and that which does exist all requires payment (leaving with one or two spaces always available in line with the contributor's vision). Twenty-three years ago, we had a huge shopping mall built on cheap land on the north-eastern edge of town - about 10 minutes drive from the centre of the city - with abundant, and free, parking. The result? The entire 'city experience' of Sheffield has migrated under the roof of this privately-owned mall, leaving the historic core of Sheffield a mass of boarded up shops, devoid of any life and vibrancy and interest. I would therefore caution against the advice of this contributor. The car is such an overwhelmingly attractive method of transport versus the alternatives, people would much rather bear the cost of driving longer distances to free parking, than ditch their cars. Sad, but true. If there is little interest in downtown Sheffield, I would expect that few people or cars go there. If few people or cars go there, the area should have l0ts of available parking spaces. If there is ample available parking, Prof. Shoup would likely recommend dropping the price until they are close to full again. This cheaper parking would bring back customers for the boarded-up shops. It sounds like downtown Sheffield has the opposite problem of most cities -- their public parking rates are too high. Fundamentally though, it's the same problem -- the city mispriced parking, which seems to happen in lots of cities. Except many will remember the last time they tried going there parking cost a lot, whether it is true anymore or not is irrelevant, because they are already at the other place. Was talking to the owner of a resteraunt. During a major highway construction project, most street parking near his place was gone for 2 weeks, he had a small parkinglot, but couldn't hold his normal amount of clientel, and was only half full during the disruption. Only 2 weekof parking disruption. but it supposidly took 4-6 months before customers numbers were back up to what they were. An interesting different experiment could be happening. Tysons Corner, VA has 2 large popular malls, it is currently undergowing a huge construction project to put a metro station in. A side effect of that the normally free parking at the malls will now be apid parking. I'm curious how this will affect customer numbers. A comparison will be difficult since it is a multi year project. and the economy may not resemble what it was before it was started. Not covered in the excellent podcast was ... why should the city be providing on-street parking at all? If there was none in the face of reasonable demand (people who want to drive to shopping etc.) off-street parking would be built and users would pay for it. Real estate would be put to its economically best use. This would speed the flow of traffic (one more lane and no cruisers in search of a space), solve the problem of non-paying parkers and eliminate the need for costly enforcement. I think that converting some of our more expensive cities to "(almost) no parking" cities would ultimately be desirable. I don't think it should be done all at once, though. It would make more sense to slowly reduce the parking requirements for businesses and new construction over time. One way to do this would be to reduce the parking requirements according to how close to a major transit point it is. So after a few years of stepwise adjustment (which ought to be retroactive to existing occupants), you might reach a point at which a restaurant might require ten parking spaces, but a restaurant two blocks from a subway stop might require only six spaces, and a restaurant immediately adjacent to the subway stop might require only a drop-off space and a space for a delivery truck. You could also require that the spaces be non-free to receive the benefit, which would give the mid-point restaurant a choice between providing ten free spaces or six paid ones. I'd love to be able to summon a driverless car to my door, but I don't think it would work well for people transporting children. It's one thing to step into a car and tell it, "Take me to this address", and then get out and tell it, "Send a car to pick me up in four hours". It's another thing to completely install two or even three car seats before departure (could take 15 minutes each!) and then remove those car seats upon arrival and have to lug them through the store or find a place to stash them at your location—and then repeat the install-removal process just to get home. The statistical likelihood of a crash is likely to be *extremely* rare in a computer-driven car, and of course your hands are free to hold the baby. And since you don't need a car anymore, you could extend your house right over that driveway for a significant storage boost. Still, you do make good points. I think driverless cars are an inevitable part of "the mix", but probably not the whole solution. Frankly, I can't wait! Holding the baby does not work in a crash. Human arms are just not strong enough. That's why there are infant car seats in the first place. Second, my own experience as a college student. I lived about 15 miles from campus, and student parking, though ample, was about a mile from my classrooms, so I would spend half an hour driving, half an hour parking and walking to class. But I found that I could bike from home to classroom in 50 minutes. What was the music used in this episode? Is there somewhere I can find the music credits for all the episodes? I often like the BGM used on freakonomics. Is there somewhere I can find the music credits for all the episodes? I often like the BGM used on freakonomics. Click on the "Audio Transcript" button above and you'll find all of the music credits for this episode. I live in Vancouver, British Columbia and parking downtown is VERY expensive. I love it that way. I think that anything that discourages car ownership is great. Your podcast never discussed all the people who choose not to drive (they walk or use public transportation) or choose not to own a car because it is so inconvenient. While I don't know of any scientific research that has measured all the cars "not on the road" because of the inconvenience of parking etc. I am willing to bet it's a lot and would in a lot. The bonus is walking is healthier. Why would anyone want to make it "easier" to have cars on the road? A lot of us in San Francisco deal with the parking issues by getting around on motorcycles and scooters. In some cases, it's actually cheaper than public transportation! Anytime I have to park in a city I grumble. It is such a hassle you have to look forever to find a spot and once you do, you actually have to park there which can be another nightmare. I think anything the city can do to make intensives to have people use mass transit is good. This story was interesting to me because, as a wheelchair user, there really isn't enough parking. I joke that I'm in my wheelchair for the parking, but I'd say 30% of the time, we have to pull into a regular space because the blue ones are used up.